Jeff's Bike Blog: Whats a Brevet? See below. Whats a Brevet? See below. We are planning to run a Great Divide style event in the South Island - a 1200 km, mixed terrain, self-supported cycle tour with a reasonably challenging time cut-off. Here's a map and some notes on the event (below). We are still working through land access issues, which may well be resolved by requiring every rider to carry a personal locator beacon, but we thought we'd go public now so that you all have time to sort out gear, leave, fitness, etc. We'll set up a dedicated blog shortly and then get some serious discussion going then. In the meantime, if you have any burning questions or comments, fire away. (trying to get long days and good weather, but little holiday traffic). Start Blenheim, round Port Underwood road, Queen Charlotte Drive, Maungatapu Track, backroads to St Arnaud, Porika Track to Lake Rotoroa, Braeburn Track to Murchison, over Maruia Saddle backroads to Springs Junction, Rahu Saddle to Reefton, Big River and Waiuta Tracks, then backroads to Blackball, backroads to Jackson, over Arthurs Pass to Sheffield, Wharfedale Track, Lees Valley to Hanmer via back roads (? 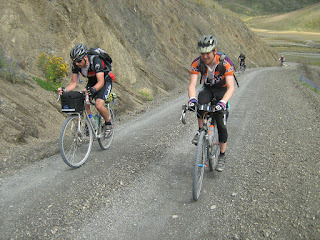 ), Molesworth Station, Taylors Pass and then singletrack back to Blenhiem. Approx 1200 km (note: our Google Map takes micro-shortcuts and under-estimates the total distance). Riders must carry all their own gear (i.e. no domistiques). No outside support (deliveries only to public addresses, no support from friends along the way). Prior to the race you may only post supplies to post offices. Follow 100% of the course. Riders must carry a personal locator beacon, and agree to cover the cost of rescue in the event they need to be evacuated. Times under 4 days will be recorded as 4 days, 0 hours. (We're not after an exercise in sleep deprivation). Riders must finish in under 8 days. When on public roads, follow the Road Code. Cell phones OK, but must not be used to call for food or supplies (or any other assistance) to be delivered (except to a public address/business). Call-ins to be made from designated towns to an 0800 number. In the event of Molesworth Station being closed to cyclists due to fire risk, riders are to proceed through the Rainbow Station and North Bank road. No entry fee; no prizes. Some sort of koha will be requested for community charities along the route (yet to be determined).